Aditya Jayanthi: “Wednesday, March 2nd will be the Ryan Jewell Quintet. While this is not my original music, it is a band that I am very proud to be a part of. Ryan’s compositions are wonderful and I have a blast playing them. I joined this band after tenor player Wes Perry moved to the west coast to further his education. Therefore, I’m playing the tenor saxophone book on guitar. It has been very fun/challenging/ interesting to assume the role of a horn player in a jazz quintet as a guitarist. March 9th will be Turtle Boat Trio. This group is basically Alex Burgoyne and myself featuring a different drummer each time. We play originals by Alex and myself, a handful of Paul Motian compositions and some other melodies I’ve arranged that come from other musics that have nothing to do with jazz. The only rule for this group is that, with the exception of a couple pieces, the drummer is not allowed to know anything about what we’re going to play beforehand. This week we will be featuring Adam Nedrow (of the DewDroppers) on drums. March 16th will be Circus of Cool. [Circus of Cool was started by Don Pavelcik and Lady Monster in 1995, based on Pavelcik’s desire to create a “Rebirth of The Beat,” where they would combine improvised jazz with poetry. 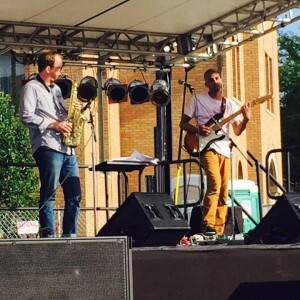 Though Pavelcik passed away from thyroid cancer in 1999, the band has continued under the leadership of Krista Kitty, and helped to inspire the founding of an all-jazz stage at Comfest (The “I Wish You Jazz” Stage is named after a Pavelcik poem). Beyond playing saxophone,] Alex Burgoyne will be reading some of his poetry as well (it’s super great, burgoynealexburgoyne.com if you haven’t read it before). This is another example of it being “not exactly my band” but something that I’ve been a part of that means a whole lot to me. March 23rd will be Turtle Boat (in it’s original format as a sextet). Alex Burgoyne and Mark Donovan on saxophones, myself and Brett Burleson on guitars, John Allen on bass, and Maxwell Button on drums. This is the group I was planning and arranging for during my transition back to Columbus after being in the Army band for 3 years. The instrumentation is loosely based off of Paul Motian’s Electric Bebop Band of the 90’s although we also play pieces that were recorded by Motian’s trio and quintet bands of the 80’s.